Le Mariee' : 51 Reviews And Counting! I am so excited that I reached 50 reviews on my weddingwire listing this weekend! My goal was to reach 40 my summers end.. But I got over 50!!!! And I want to thank all of the brides who took time out of their busy lives to write these reviews!!! I would say 3 out of 5 brides write the reviews nd send them in, which I am grateful for! Why are the reviews so important? They help me to learn what meant the most to each bride, were you happy? Did I enhance your wedding day? Did your makeup hold up? Was I puntual? And also, if there was something I could improve on ofcourse I would love to hear. Ofcourse I would be dishonest If I said, I would prefer that part in an email instead LOL. 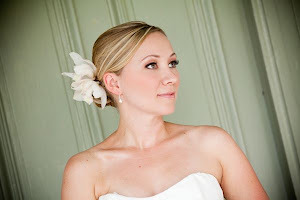 So, Now I started my listing on the Knot and I am working out inviting brides to send reviews there as well, so brides to be can hear about others experiences with me as their makeup artist. Summer of 2010 was awesome!!! Much love and best wishes to all of my brides and thanks so much for chosing me as your bridal makeup artist!!! Congrats, Lori. That is fabulous. Reviews are so helpful for yet-to-be customers to see our magnificence. And you must be VERY magnificent to get that many reviews. Well done!